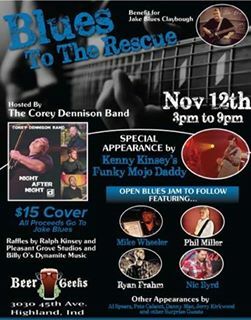 Join us Sunday, November 12th as blues musicians converge to raise funds for local blues hero ‘Jake Blues Claybough’ who was recently injured in a tragic accident. Hosted by The Corey Dennison Band with special appearances by; Funky Mojo Daddy, Mike Wheeler, Phil Miller, Nic Byrd and more! Raffles by Ralph Kinsey and Pleasant Grove Studios and Billy O’s Dynamite Music.